What a beautiful setting for an event. The North Shore Marathon bills themselves as the most scenic marathon and half marathon in NZ, and I don't think they'd be far wrong. What a pity, then, they made such a crap job of organising the event. My 1km time splits, taken at their km markers, should give you an idea (remember I was doing 5km). And then I got talking to some of the other runners. One of the women who'd just finished the marathon ended up running 45km because the course marking and number of marshals was so poor. Quite a few of the half marathon folk ended up doing either 29km or 18km. I have written a long email to the organisers, now that I've calmed down, letting them what I think they could do to improve for next year. I just keep thinking how demoralising it would be for someone in their first long distance event to have this experience. But on the plus side - my 5km time was 33.38. An improvement of 1 minute and 53 seconds - gotta be happy with that! And it wasn't a dead flat course this time either; total gain was over 18m. All in all, it was a lovely Sunday run. 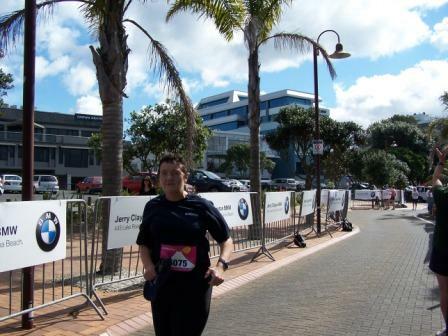 I've finished my 8 weeks of training with Up&Running and ran my 5km on Monday. This is the longest distance I've ever run at one time. My time was: 35 minutes and 31 seconds. Very pleased with that! Especially given the weather. I know lots of the country had terrible storms and snow; we escaped that (in Northland), but it did hail while I was running. Which makes me some sort of properly tough athlete. And in a move that has surprised even me, I've now signed up to do Up&Running's 10km course in September! I can't sing the praises of these courses enough. I never imagined I would be running these distances, let alone enjoying it.